We visited Gotland at the beginning of August 2015 to attend the Medieval Week. 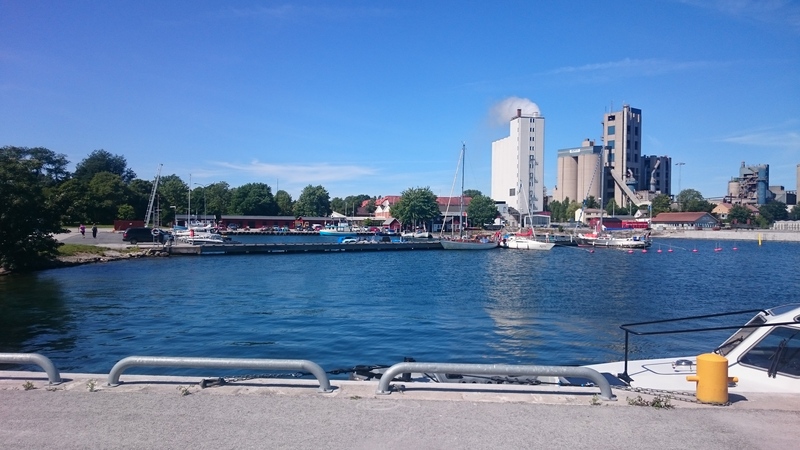 As we arrived from east, we decided not to use Visby harbor as it takes almost a day to sail around the island, also the Visby harbor is overpopulated at summer time. Instead of Visby we used small marina at Slite. It’s located on west coast of Gotland, small, clean and easy accessible harbor. It’s hard to miss even nighttime as cement factory is great illuminated landmark to find marina entry. Marina manager is visiting harbor just once per day, at morning about 10 a’clock. He drives silver metallic Hyundai van and also white/blue fishing boat you can see in the middle of picture above (click to enlarge). He’ll give you smartcard to open the toilets. If you arrive at night and don’t find the manager but want to use toilets or shower then at the end of dock (on the picture, behind of silver metallic yacht) is a mailbox were you have to leave card before you leave marina. So usually there are few cards you can use, box is not locked :). Every card is usable 100 times. Marina fee is 100 SEK per day, also one toilet card is 100 SEK. 220V and fresh water are on dock. On message board you can find marina manager phone number but it drives you actually to Visby marina. Usually they can’t give you more information you can find right here :). We recommend you to visit fish shop in marina. At the morning you can buy there some fresh warm smoked fish. It’s not expensive and it’s really delicious! Most important places near to marina you can find from map above. Gas station is 300m from dock so if you want to fill the boat tanks then you have to have canisters. You can ask local fishermen, hopefully they help to bring fuel to marina on their car. We rented a car from Visby for three days so we used it also to carry canisters. Cash machine (ATM) and Swedbank is located on Stationsgatan near Coop Konsum market. There are also bus stops, one on Skolgatan close to Cementa AB main office and another on Stationgatan close to Coop Konsum. Bus ticket to Visby costs 60 SEK, they accept cash only! If you plan to stay more than 2-3 days, you have company more than 4-5 people and/or you plan to visit lot of places on Gotland then we recommend to rent a car. Of course you can buy a bus ticket (for example, 72h whole island ticket for adult costs 300 SEK) but for bigger company and longer stay the car rental is cheaper! We got 7-seat Chrysler Voyager for 445 SEK/24 h (includes excess reduction) from car rental in Visby marina. And you can go wherever and whenever you want, you didn’t depend on bus timetable! It’s the truth is a nice and useful piece of info. I’m satisfied that you simply shared this helpful info around. writing like yours currently. I seriously appreciate individuals like you! really informative. I’m planning to look out for brussels. I’ll appreciate should you continue this from now on. Numerous men and women be benefited from your writing.